Tonight I'm reviewing the beer I had at lunch time today and was suitably impressed to buy a 6-pack off the restaurant I was eating at. I hoping it will taste as good after dinner as it did with Vietnamese chilli soup for lunch! Curiously this beer mentions of the label that it is brewed in accordance with the Rheinheitgebot, a.k.a the German Purity Law of 1516. This is somewhat unusual as you normally don't see this marking on any beer other than those from Germany or a former German colony (Namibia for example). Anyway let's review this one and hope the chilli soup wasn't masking a nasty underlying flavour. Dai Viet Dark Ale is an Altbier, the first one I've reviewed on Beer O'Clock Australia but certainly not the first one I've ever had. In terms of appearance this beer is most comparble to Coca-Cola. The colour is a dark brown with hints red when held up to the light. There is a creamy-brown head which leaves very little lacing and doesn't last that long. It's not a bad looking beer but nothing special. On the nose this beer has the malty characteristics of a light porter and also has strange hints of whiskey, like an oak aged beer. The nose gives an overall sweet sensation however there is nice bitterness provided from the hops, which smell typically Asian. 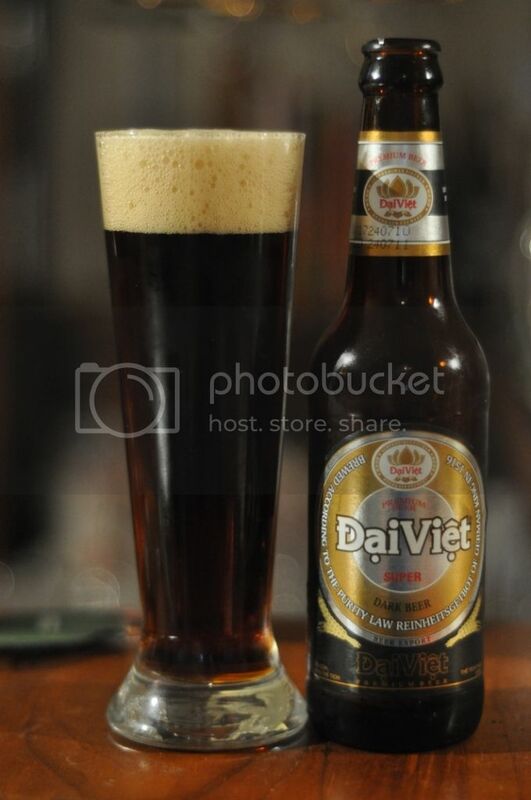 Dai Viet Dark Ale doesn't smell like your typical Altbier, but doesn't smell bad either. Drinking this beer tonight I think I am picking up a fair bit more flavour than I did at lunch. There are lots of caramel malts and there is still that hint whiskey. The beer is actually quick thick and a little gluggy with little to no carbonation to liven it up. The finish is quite dry and has a nice hop bitterness to it. Overall it's a really quite interesting dark beer to have with food. In my eyes this beer is more of a Bock than an Altbier. Despite this potential classificatioon muck-up Dai Viet Dark Ale is nice beer. The malt flavours are fantastic and the hops provide just enough bitterness to balance the beer. Some, including myself, would say this beer is a bit too thick and it is a little hard to get through if it warms up. If you aren't adverse to thicker beers give this one a go, the flavours are surprisingly good for a South-East Asian beer.